"Avoid being vulgar. Excitable bouts of wind-breaking will not endear you to girl, just to pick one example"
As you can tell, this is not a book just to be read alone. Having your Dad, a Grandad, an Uncle or your best mate to explore and make this stuff would help (okay, your Mum could help but...). 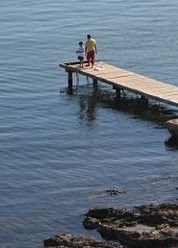 Here's a chance for boys to be boys, and in particular, to do some stuff with their fathers. I've commented previously in this blog about the important role that fathers play in supporting their children's learning (here) - this book is the perfect vehicle for strengthening relationships between fathers and their sons. It will certainly get them off the computer and outside. There will be critics of the book who won't like its assumption that boys and girls are different (I think they are different) and some might also be critical of the somewhat idealised expectations that the book might raise for adventure and fun that might not be met for Dad's or their sons. I wouldn't worry about this, there is lots to have a go at that WILL meet expectations; so maybe apartment dwellers will find the tree house tough, do something else. On the gender difference issue, there is ample evidence in the research literature now that supports the view that boys and girls are different (not just culturally and due to socialisation). Leonard Sax's book "Why Gender Matters" is a good introduction to the topic if you are interested (I'll try to review it in a future post). And for those who must have some gender equity the recently released "The Daring Book for Girls" by Andrea Buchanan and Miriam Peskowitz should keep you happy [Update to this post, 10/10/08 I have now reviewed this book here). The book is a little pricey at $AUS45 list price (you can do better than this at good bookstores - $25-40) but it's worth the cost. There is also now a pocketbook version out that is cheaper. "This volume is chock-a-block full of practical ways to exercise the mind and imagination...". But he also stresses that it's dangerous. "Once you've hopped into the canoe and paddled out into the stream of information, you may never want to return to the humdrum world of mass-produced experience." And yes, I now have my own copy! My wife Carmen bought it for me. 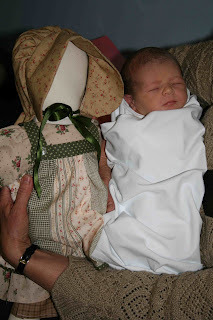 My daughter Louise and her husband Jonathan had their second child this week, a little girl who they have named Evelyne Adel (that's her on the right 1 say old with the doll her Nanna Carmen has made for her). She is our 5th grandchild. Little Evelyne has been born like other children with the most amazing brain of all living creatures. But this week her little brain is made up of cells with enormous potential that are undergoing massive change. The genes she has inherited from her family will have some impact on the number of brain cells, their initial arrangement and their potential (far too early for me to take much credit! ), but her environment will also have a huge impact on her brain’s development. On Monday (15th September) when she was born, her brain contained about 100 billion neurons (i.e. as many nerve cells as astronomers tell us there are stars in the Milky Way). Before birth, the brain produces many more neurons (probably double) and connections between the cells (“synapses”) than are needed. Every neuron has an output fibre (an “axon) that sends impulses to other neurons. Each neuron in turn has many hair-like input fibres (“dendrites”) that receive impulses from other neurons. As Evelyne grows the number of neurons will remain relatively stable but each cell will grow and become bigger, mostly because of the massive growth in dendrites that branch out like flourishing trees. It is these dendrites that will be stimulated when her parents (and her Grandad!) play with her, talk to her, show her new things, as she listens to new sounds or old familiar ones, as we cuddle her and care for her. As she encounters her world in her first year of life Evelyne’s brain will undergo huge change, it has already undergone great change since Monday! But what Evelyne has been born with is just the beginning; it is a framework for development and learning. The environment that she lives in will have a big impact on how her brain cells will be connected or “wired” to each other. Her experiences, sensory stimulation, interaction with others, language, the love and care she receives and so on, will all have a huge impact on development. During the first days, weeks and years of life, her brain will undergo a series of extraordinary changes. The biggest change will be in the connections between her brain cells. There will be constant growth in new connections and the loss of those that are rarely or never used. Scientists tell us that that there are key times, critical periods, when specific forms of learning take place and with it brain development and change. We also know from research that if children are deprived of a stimulating environment the development of their brains suffer. For example, researchers at Baylor College of Medicine, have found that children who experience little play or who are rarely touched develop brains that are 20% to 30% smaller than is normal. So we know that stimulation is critical and it started for Evelyne on Monday. 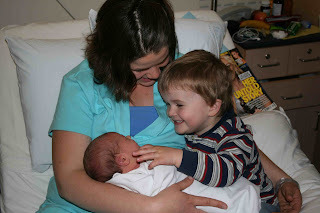 She started attending to her world on day 1. We have known for a long time that early stimulation establishes the foundations for children’s later learning. It has an influence on how children will learn, and how effectively they will learn. Recent research has taught us new things and has underlined just how important the first days, weeks and years of life are for learning. The early experiences of the child (whether good or bad) have an influence on the development of their brain and the ‘wiring’ of their nervous system. We know that loving interactions with caring adults stimulate brain development, strengthening connections between brain cells and causing new synapses to grow. Those connections that are used become permanent, whereas a lack of stimulation will retard the development of synapses and as a result, the brain will have fewer connections. The child’s emotional stability and emotional security is also very important. More recent research on human stress-sensitive systems shows that early stress has an impact on brain development. Physical or emotional stress and trauma can lead to the release of the hormone cortisol and higher levels of cortisol reduces connections and can lead to the death of brain cells. So babies with good emotional bonds with their parents or caregivers will have lower cortisol levels in their brains and hence a better chance of good brain development. 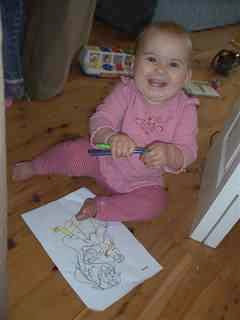 So, as Evelyne’s grandad I’m already on the job with my 5th grandchild (and so is her Nanna). I’ve been talking to her, trying to gain her eye contact, stimulating her senses, cuddling her, patting her and making those soothing sounds that only parents (or grandparents can make), those sounds that let the small child know that someone is there, that they are loved and that they are safe. I’ll bombard little Evelyne with stimulation (sensory stimulation of all kinds), I’ll get her far too excited (sorry Lou) and give her experiences that will make her squeal and search for words to express her joy and happiness. I'll also cuddle when she's hurt or sad and talk to her about important stuff as she grows. And as I do this I’ll be helping her amazing brain to reach its potential. I thank God for the wonder of life and the precious gift of families and children. 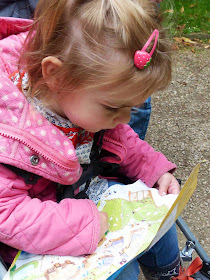 I've written a lot about play and other ways to stimulate children in the early years. The labels on the sidebar of the blog will help to find these, but you can access a series of three posts I did on play here. For a more detailed discussion of the brain's development as well as problems with development, there is an interesting introduction in Time magazine that I found helpful. J. Madeleine Nash, "Fertile Minds", Time magazine, Feb 3, 1997. A basic introductory article from the University of Maine might also be of interest (this draws on the above). When do children start writing? How soon can children start writing? Traditionally, educators and teachers once assumed that children could only learn to write once they had foundations in listening, speaking and reading, pretty much in this order. Was this correct? Well not really. In terms of proficiency there are some good grounds for supporting the traditional order, but it is rather simplistic to assume that it is such a lock-step process. As well, this strict developmental orthodoxy has a tendency to delay attention being given to writing. It is true that children's aural vocabulary is typically in advance of their spoken vocabulary well into early childhood. As well, children seem to develop an ability to read words before they can write them, and to read books before they can write extended and orthodox language. But in amongst these generally accepted general tendencies there is some fuzziness and variation. As a result, I want to argue for much more stimulation of children's early writing. There are good reasons (and evidence) to support a desire to give more emphasis to early writing. For example, while once educators, psychologists and paediatricians assumed that there is little communicative intent with a newborn baby, they now know that almost from the first day of life, babies begin to respond to their world and that many of their very early vocalisations, eye movements, gazes, facial movements and body movements are attempts to communicate. Dr Kim Oates gave a wonderful lecture on this topic at New College in 2006 as part of the New College Lecture series (you can download an MP3 of the talks here). So while speaking follows well after the ability to hear and respond to sound, attempts to communication commence almost immediately. As well, we know (it has always been evident) that children begin attempting to place their mark on the world as soon as they can grab a pencil, crayon or texta. It's as they want to be able to say, "Look, I did this. This is my mark." And of course, if you ask them what it says, they will often say, "It means me and daddy", "It's just a word", and of course, "It's just a scribble" or a "pattern" or a "colour" or a "drawing". What do we know about early scribble and drawing? We now know that even children's earliest scribbles very quickly have some mean associated with them. While at first children are as much interested in the gross motor movement (the rhythmic drawing of circular patterns, fast scribble to fill a page etc), they soon begin to attempt more and in a sense try to communicate or create meaning through their scribbles, patterns and drawing. For example, picking up on just one the above elements of authoring, Harste, Woodward and Burke observed in the scribbles of children from families who had a first language other than English some interesting differences. The writing below shows just how different scribble can be for four-year-old children living in homes that speak different languages; in this case, English, Arabic and Hebrew. They concluded that evidence like this demonstrates that at age four, even before these children are writing words, that there scribble demonstrates organization, and that this is similar to the processes used by proficient writers. What does this mean for early writing? 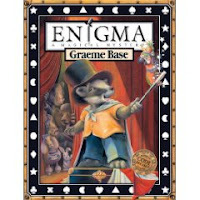 Graeme Base was born in England in 1958 and moved to Australia when he was 8 years old. He grew up in Melbourne and still lives there with his wife and three children. He enjoys playing music, and writes a lot of music on guitar and keyboards. He says that whenever he needs "...a break from my illustration work I pick up the guitar or pick out a tune on the piano....I'd love to work as a musician!" He hopes one day to make a record or maybe even write the score for a film. "I wrote my first book at the age of eight (it was a Book of Monsters and I did all the illustrations in coloured pencil), but I didn't get anything actually published till much later. I was always interested in art at school and after year twelve.....I spent three years studying Graphic Design at college. I worked in advertising for two years but didn't like it much, then began doing a bit of illustration work for various publishers. I began illustrating children's books because of a growing disillusionment with the sort of work I was doing in the advertising industry. Book publishing offered me the chance to be far more creative." He quickly decided that it made more sense to start writing the books as well as illustrating them. "My first ideas for books were turned down by lots of publishers, but I finally succeeded with My Grandma Lived in Gooligulch in 1983. This was the first book I had published that I both wrote and illustrated. I prefer drawing to writing, in fact I only write books so that I can have the fun of illustrating them! When I begin work on a new book, I know there is a long road ahead and I can never really be sure whether other people will like it when it's finished. The Eleventh Hour took two years to create and Animalia took three, that's a long time to spend on any project! I don't actually write my books primarily for children, although I know this is the main market for my work. I write them for myself in order to fulfil a creative desire and only after these considerations do I look at the requirements of a 'children's book,' whatever that might be!" The basis of Graeme Base's work is generally fantasy, with the use of detailed realistic illustrations with amazing detail and vibrant colours. Each page is a work of art - literally! To make his illustrations even more realistic he uses watercolours and transparent inks, and an airbrush to spray colours onto the board. In more recent years he has made use of computers to aid his creative work. For example, he captures on screen video images of movable models of some of the main characters. "Animalia came from a great love of animals and a desire to create a book with huge amounts of detail and things to discover. That was the sort of book I remember enjoying as a child. I wrote it in alliterative form because I thought it would be a lot of fun for people to read aloud. I put the little boy in every picture to make people look closely at the pictures rather than rush through from page to page. It's really a picture of me when I was young! The word 'Animalia' is Latin for Animal Kingdom." "I got the idea for The Sign of the Seahorse during a trip overseas in 1989. It was mostly a working visit to the USA, but we managed to spend a bit of time in Ecuador, Peru and the Caribbean as well......It was during this last adventure in the Caribbean that the idea for a book set underwater came to me, but I actually came back from the trip with enough ideas and reference material for several other books as well!" The great strength of Grame Base's work is the illustrations. His creativity shows in every image and as a result, they provide a wonderful stimulus to the creativity of children who experience them. My favourites are Animalia, The Eleventh Hour and The Sign of the Seahorse. The latter isn't without a few blemishes but the richness of the plot, the multi-dimensional layering of image, spatial representation through the map and richness of the story gives this book great depth. His books have another strength in that they work at multiple levels. I have 'read' "Waterhole" to my grand-daughter at age 12 months creatively re-telling the story and letting the illustrations (and the holes in the pages) do the work. But I have also enjoyed sharing every word and dissecting every illustration with my 5 year old grandson. Revisiting the map, trying to work out where spatially key events in the narrative were located and so on. Teachers will find this resource site useful. 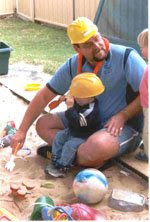 "....we either lack Australian research or we have research in a variety of areas with no overview to make it useful to policy development"
The network has been supported by an initial grant from the Australian Research Alliance for Children & Youth (ARACY), a national organisation with more than 850 members (including individuals and organisations) across Australia. ARACY encourages collaboration between researchers, policy makers and practitioners from a broad range of disciplines. ARACY's founders believed that by working together we are more likely to uncover solutions to the problems affecting children and young people than by working in isolation. The AFRN aims to promote high-quality collaborative research into fatherhood and fathering in Australia by encouraging researchers, academics, managers, practitioners and those developing policy to pay attention to the important role that fathers play in family and community life. I am convenor of one of the four planned strands of research - The father’s role in children’s literacy. This is a new venture that is housed within the successful Family Action Centre (FAC) at Newcastle University. The FAC aims to strengthen families and communities by undertaking research, training and learning; developing and implementing strength-based programs; and creating models of practice that promote sustainability, social justice and community leadership. Hopefully, this new network will have some positive outcomes and will lead to new research on the role of fathers, as well as new knowledge concerning how we can support fathers to be even more effective in fulfilling their important unique role within families. If you would like to join the network and receive regular updates you can find a link here.